The Beomaster 4000 was positioned in the range above the Beomaster 3000-2. It offered, in addition to the 3000-2’s many facilities, built-in ambiophonic stereo switching, connections for a second tape recorder and most importantly, more power. Rated at 60W, the Beomaster 4000 was as powerful as the previous Beolab 5000 system. Advances in electronics and manufacturing technique had allowed the Beolab 5000’s capabilities to be included in a smaller, simpler, more elegant package, and so once again an amplifier with what was at the time a massive power output featured in the B&O range. Text copyright © Beocentral. Unauthorised reproduction prohibited. In contrast to the Beomaster 3000-2, the fascia of the Beomaster 4000 was finished in black. The sliding controls also had black trims, and green hairline markers, matching those of the Beocord 2200, the recommended cassette deck for the model. To allow for extra cooling for the hard working power stages at the rear, a metal grille, in matching black anodised aluminium the fascia, was fitted across the rear of the cabinet. Apart from these cabinet details, visual changes were few and tricky to spot. Those with sharp eyes would notice that the switch for the second pair of loudspeakers was marked slightly differently, and that the L-mono-R switches had been replaced with a mono switch and top-cut filter for the rear ambiophonic loudspeakers. The only other difference on the front panel was that the “phono 2” switch was now labelled “tape 2”. This connection was more suited to a cassette deck than an open-reel machine as it was not included in a monitoring loop. Only small changes were required to the circuit to make this change, the phono 2 input of the Beomaster 3000 and 3000-2 was “line” level anyway (for a ceramic pickup or a Beogram with a pre-amplifier), so all that was needed was to add connection to the socket to provide an output for recording. Of course the above-mentioned types of record player could still be connected to “tape 2”. At the rear, a small switch was fitted to switch between stereo and ambiophonic reproduction on “speakers 2”, and the duplicated RCA connections associated with the DIN sockets had been removed. Text copyright © Beocentral. Unauthorised reproduction prohibited. While most of the basic assemblies inside the Beomaster 4000 were much as those in the Beomaster 3000-2, including much of the power amplifier. The use of Darlington output transistors and an increased supply voltage were the main changes that yielded an increase in output power. Some versions had extra variable resistors associated with the output transistors which had to be carefully adjusted to obtain the best performance and stability. Text copyright © Beocentral. Unauthorised reproduction prohibited. The Beomaster 4000 was the centrepiece of a sophisticated Hi-Fi system, which also comprised Beogram 4000, Beocord 2200, Beovox 5700 and if desired, Beovox 2702 as the extra loudspeakers for ambiophonic reproduction. 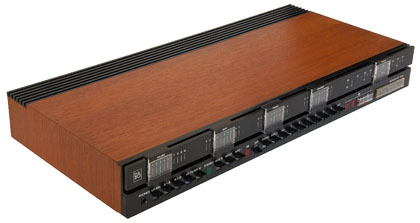 Other expensive Beomaster models, such as the Beomaster 6000 4 channel, overshadowed the 4000 in its later life, but the concept was revived in 1978 in the form of the Beomaster 4400 and 4401. Text copyright © Beocentral. Unauthorised reproduction prohibited.